It is absolutely impossible even for the designers of the software to find a lost password or to open the folder. 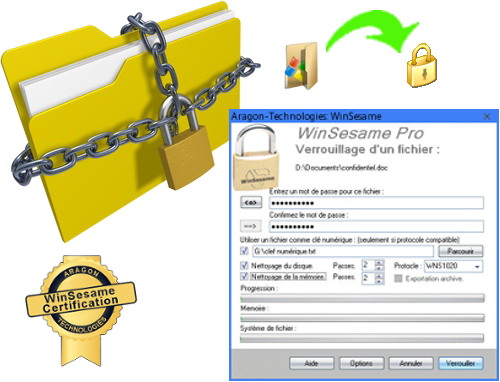 The cryptographic algorithms used by WinSesame are designed to resist the most powerful methods of breaking and the key does not appear anywhere in the encrypted data (lost key system). The length of the key is not limited. More: using the WNS1040 algorithm you can lock your files and folders using a numeric key file whose size is not limited. This algorithm is the most powerful currently available. It uses the latest technologies of cryptography.